The following press release about Turkish aggression was issued today by Nicolas Bay MEP, co-president of the ENF (Europe of Nations and Freedom) group in the European Parliament. The Europe of Nations and Freedom group in the European Parliament (ENF) condemns the escalation of border incidents caused by Turkey on land and at sea. After a meeting in Brussels earlier this week between ENF vice-presidents Gerolf Annemans and Marcus Pretzell, and Failos Kranidiotis and Panayiottis Doumas from Nea Dexia (New Right party), the ENF Group condemns the blatant violation of Greece and Cyprus’ sovereign rights by Turkey. Several serious incidents occurred in less than a month’s time. On February 9, Turkish warships obstructed a drill rig contracted with by the Italian energy firm ENI from approaching an area to explore for natural gas inside the Republic of Cyprus’s exclusive economic zone. Several subsequent attempts to reach the area were equally obstructed. On February 12 at around midnight, a Turkish patrol boat deliberately rammed a much lighter Greek coast guard vessel that was anchored off the Greek island of Imia in the Aegean. On March 2, two Greek soldiers were detained by Turkish forces after allegedly having crossed the border into Turkey in a heavily forested frontier region under bad weather conditions. There are doubts whether this really happened on Turkish territory. There are also serious concerns that the Turkish government wants to use the detained officer and private as a bargaining chip for the extradition of the eight Turkish medical officers who fled to Greece after the coup in July 2016. The Supreme Court of Greece ruled that the Turkish officers would not be extradited. Although this court ruling is final and cannot be reversed, the Turkish government still demands their extradition and proves not to understand fundamental European democratic principles like the separation of powers. The ENF Group stresses that Turkey does not belong in the European Union. The EU must stop the accession negotiations with that country and must stop all pre-accession payments. This entry was posted in Counterjihad, Europe, Middle East, National defense, News, Politics by Baron Bodissey. Bookmark the permalink. Actually, you don’t need concrete border provocations to come to that conclusion. Turkey was only ever viewed as an ally because the historic Turkish enmity with Russia served the purposes of NATO. Turkey will have to be treated like any other hostile, powerful neighbor; which is to say, in some cases, Turkey will get its way in disputes. But, the main point to be gotten is that NATO is spending its money and resources arming against a depopulating Russia whose “aggression” is simply to make strategic border adjustments. The real military threat to Europe is obviously Turkey, and Turkey is a member of the European defense organization, NATO. Bringing Turkey into the EU might bring things to a head a bit too quickly for the Brussels poobahs. By completely opening European borders to the large Muslim population of Turkey, it would become necessary for West European populations to either take armed resistance, or die forever. The same effect could be achieved at much less risk by continuing to draw out the long, slow and steady population replacement as implemented by the open immigration policies of Western governments. Currently, Turkey is by distance the biggest threat to Europe. – Russia ceased to be a threat since destalinization started under Chrustchev after 1956, and has returned to its Christian roots, while Putin is clearly seeking an approach to the West. – Iran is not in any alliance, is under international monitoring, doesn’t border Europe, and most young people there long for a regime change away from the Mullahs. – the invaders from Africa and the Middle East could be stopped if the European politicians would allow their armies to do so (about which we still hope for a political change in that direction). But Turkey is militarily the strongest NATO member after the powerful but far-away USA, the strongest country in Europe after the huge but excluded Russia, and the strongest country in the Middle East after the very clever but tiny Israel. Add to this the fact that it is ruled by a megalomaniac dictator, who has allied himself to a totalitariaon ideology (the “religion”of “peace”), who imprisons every one who opposes his regime, and who seems to be very popular as well in large sections of the population, leaving the question open whether this is in spite of or because of this. This is the reason why Trump declared the current state of NATO obsolete. The idea of a military alliance between like-minded nations is more necessary than ever, but it should be one that does not include our worst historic enemy (Turkey), but instead includes potential allies like f.ex. Israel, Russia, Ukraine, Belarus, Georgia, Armenia and Serbia. In this acute situation we are in, we cannot be picky and only include so-called “democracies” (for which only Israel qualifies in the group mentioned above). Don’t forget the enormous fifth-column of Turkish traitors that Erdogan controls in Germany and several other countries. It is ridiculous that second- and third- generation Turks in Germany are allowed to keep dual citizenship, and vote in both countries’ elections. They need to be put on the spot and told to choose where their loyalties lie. Now the nation states have become a chimera. Elites are no longer interested in the progress of human society. They are only interested in power and natural resources. US warships will ensure the safety of work to find gas deposits near Cyprus. US warships will ensure the safety of work to find gas deposits near Cyprus. Do you finance the US army for your taxes to make the oligarchs rich? And so it is everywhere. I am waiting for the day when the great leader will try it on Israel in order to please his muslim brethren. Did anyone hear about the Samson Option? 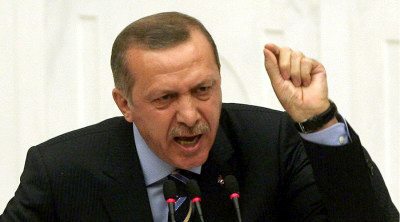 Turkey under Erdogan is becoming more and more belligerent, and is acting like the neighbourhood bully. But like most bullies, he chooses weaker victims, the Kurds in northern Syria, Cyprus and the Greeks who he obviously thinks are weak as well. But he won’t push it with Israel, from them he would get a bloody nose very quickly. I think he knows that.